The heavy flooding in Denver and surrounding areas have temporarily focused national attention on Colorado. In the meantime, the EDEN Drought Team continues to focus on #drought recovery and mitigation resources. On Tuesday, September 24, the Extension Disaster Education Network (@EDENTweets) will host its inaugural tweet chat. 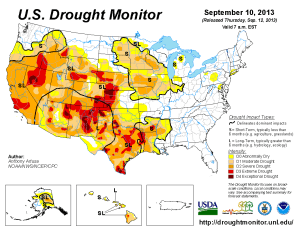 The one-hour chat, Managing #Drought, will begin at 3 PM Central, 2 PM Mountain Time. Co-hosts are New Mexico State University Extension, the National Drought Mitigation Center (@DroughtCenter) at the University of Nebraska-Lincoln, and the National Integrated Drought Information System (@Drought_Info). The chat will provide an opportunity to share resources that can help people and communities respond to an ongoing #drought or reduce vulnerability to future #drought. Follow and join the conversation on Twubs.com (hashtag #drought). From NOAA/National Weather Service Climate Prediction Center outlook maps of lagged soil moisture for next couple months. The drought monitor released today shows little change in the expanse and severity of the drought particularly in the center part of the country.